The inspection agency is investigating what the animal, born in March 1998, may have been fed early in its life, and the source of the feed. The agency said feed produced before the new rules came into force was the most likely source of BSE infection. 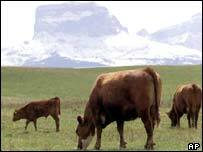 The US closed its border to Canadian beef in May 2003 after a cow in Alberta tested positive for BSE. But it recently announced it would resume conditional imports in March of live Canadian cattle aged under 30 months. An assessment team from the US agriculture department (USDA) is to visit Canada to determine whether the two recent cases of BSE should affect that ruling. The US recently declared Canada a "minimal risk" region, paving the way for the resumption of live cattle trade. Ron DeHaven, an inspection administrator for the USDA, said he remained "confident" about Canada's measures to prevent BSE. Scientists believe humans can contract a deadly brain-wasting disease by consuming beef products from cows with BSE.